The path of the initial section of the Northwestern Elevated Railroad, from Lake and Wells Streets to Broadway and Wilson on the what was then the far North Side, was cleared in 1895 and erection of the steel was begun January 23, 1896. Financial difficulties delayed construction several times, necessitating extensions of deadlines for commencement of service in the company's franchise with the city. All-night shifts were eventually required to complete the structure on Christmas Day 1899, days before their deadline to begin service. But most of the stations were incomplete December 31 and, after some negotiating, another extension was obtained. 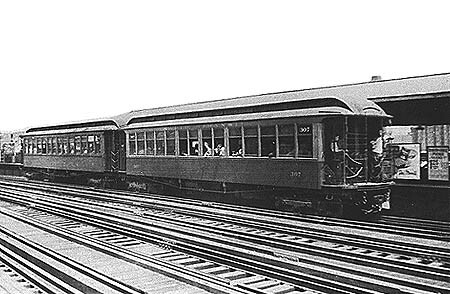 Northwestern Elevated service between the Loop and Wilson began on May 31, 1900. However, due to a two-week strike construction was not complete at all stations1. As a result, seven stations, including Clark, opened 1-2 weeks after the inauguration of "L" service. Clark station finally opened for service on June 6, 19002. The only line in Chicago to do so, the Northwestern "L" built four tracks north of Chicago Avenue to allow for both local and express service. Some stations, like Clark, were built with platforms on the outside tracks (for locals only), but some had two island platforms to facilitate both express and local trains. Each wood-decked boarding platform was covered in the center by a peaked-roof canopy with gently-curved arched steel supports and intricate latticework, covered by a corrugated metal roofing. 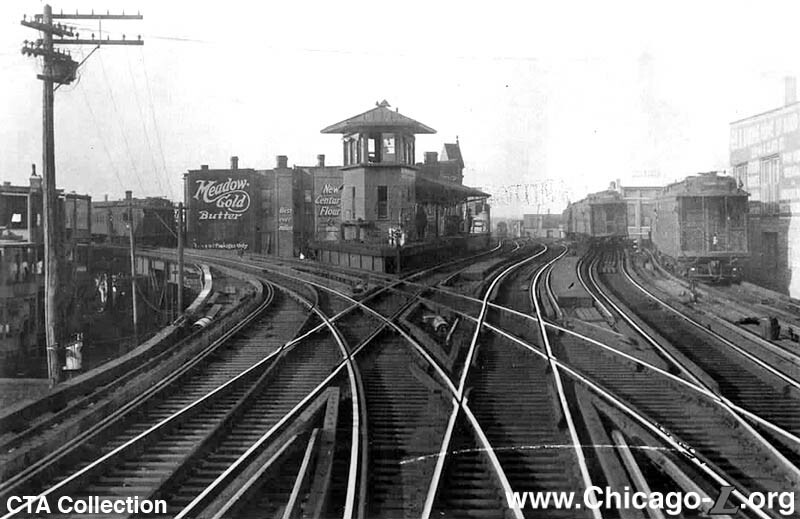 Clark station was supplemented with an interlocking tower in 1906 when the Ravenswood extension was built, connecting to the main line just south of the station. It still retained its platforms, functioning as a station for Wilson-bound trains, but not Ravenswoods. Clark's busiest year was 1906, when 944,492 passengers boarded there, making it the Northwestern Elevated's fifth busiest station (surpassed only by Wilson, Belmont, Sheridan and Kinzie, in descending order). But by 1933, Clark slipped to an all-time low, serving only 140,756 passengers, making it the north side system's fifth lowest (with only Willow, Oak, Isabella and Wrightwood, in ascending order, with fewer). 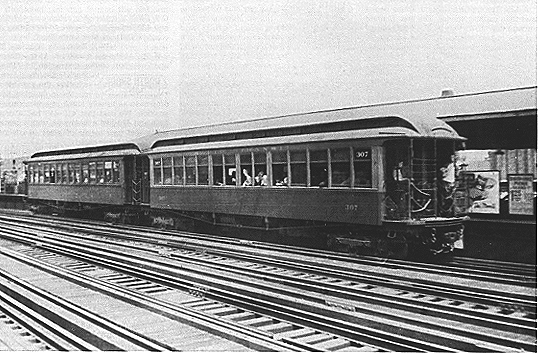 Four of those five light stations were usually served by a single 300-series Jewett Wilson-local car in the 1930s, until 1943, when Wilson-local service was through-routed to Kenwood via the elevated, giving the station a little more business. Clark survived the CTA's 1947 takeover, but was one of 23 stations closed in their North-South Route service revision August 1, 1949. The concept of "local" stations, of which Clark's low usage was only suited, was not a part of the A/B skip stop concept and the station was closed, serving 357,348 in its last year of operation. Today, the entire station is gone, with only a piece of the southbound platform left at the north end of Clark Junction. A CTA substation stands below the tracks where the station house was. 1. "ENDS STRIKE ON NEW "L"." Chicago Daily Tribune, 8 May 1900: 1. 2. "BOYS MEDDLE WITH “L” TRACK." Chicago Daily Tribune, 7 June 1900: 12.